Unlike many of the changes on airlines and at airports over the past 10 years, this one is definitely for the better! With advances in technology the choices and processes for ordering your meals on your day of travel is changing. And unlike many of the changes on airlines and at airports over the past 10 years, this one is definitely for the better! What's new in airport dining? While dining in many airports is still a poor choice between fast food or pre-wrapped sandwiches, many airports have invested heavily in improving both the quality of the food options along with the overall experiences. Airport restaurant operator OTG management is leading the way on this front. With contracts for restaurant operations and management at many large airports in North America, including all three New York airports, Minneapolis and Toronto. OTG designs aesthetically pleasing restaurants, with award-winning menus – and technology. OTG deploys iPads at each table, which are used for ordering from a visual menu. Travellers can input their flight details to receive flight status updates and a reminder when it's time to go to the gate. While waiting for the food to arrive, the iPad can be used to check the latest news or play games. I don't have time for a nice sit-down meal. What are my options? Recognizing that many travellers are starved for time and not able to enjoy the full service restaurant experience, there has been an increase of "grab-and-go" options in airports. With food designed, prepared and packaged to be taken on the plane. Kiosks or grab-and-go desks of sit-down restaurants are appearing at most airports. In an attempt to improve that experience, and the food, several new apps are now appearing that allow you to order fresh food in advance – before your journey, or even in-flight if you are using inflight wifi. The order includes your flight details, so through a combination of flight tracking and GPS, your freshly prepared food is available when you arrive at the restaurant. Best of all – you get to step into a VIP lineup so you can continue your dash to your next flight. 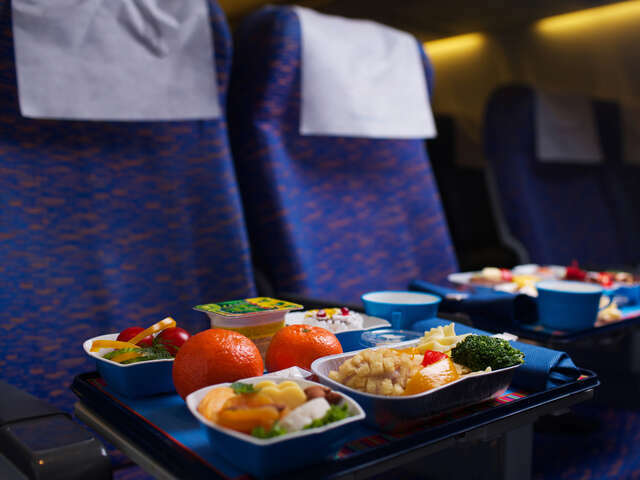 What has changed about in-flight dining? Over the past several years, several airlines (including Virgin America) have introduced the ability to order your food and drinks through in-seat video monitors. More recently, airlines have experimented with pre-ordering in-flight meals through the airline websites or apps. This has proven effective and popular amongst passengers, as it usually provides more choices than would be offered in-flight and reduces disappointment amongst passengers who don't get their preferred meal choice. For airlines, it reduces wastage as they are able to load the right number of each meal type. While some airlines only offer this in business or first class, many are offering it in economy, including Alaska Airlines. Austrian Airlines is one of many airlines that is allowing economy passengers on long-haul flights to pay a fee to upgrade to a premium meal through their pre-ordering service.